So when I saw Fava Beans on the highlighted list of ingredients for Eat Drink Local Week, I felt challenged. I’ve certainly had fava beans before and enjoy them tremendously, but actually cooking them myself? That was something I never tried. When I went to the greenmarket, I honestly wasn’t even sure what I was looking for. Would they be shelled, like fresh English peas? Would they be dried like the black beans I get from upstate? 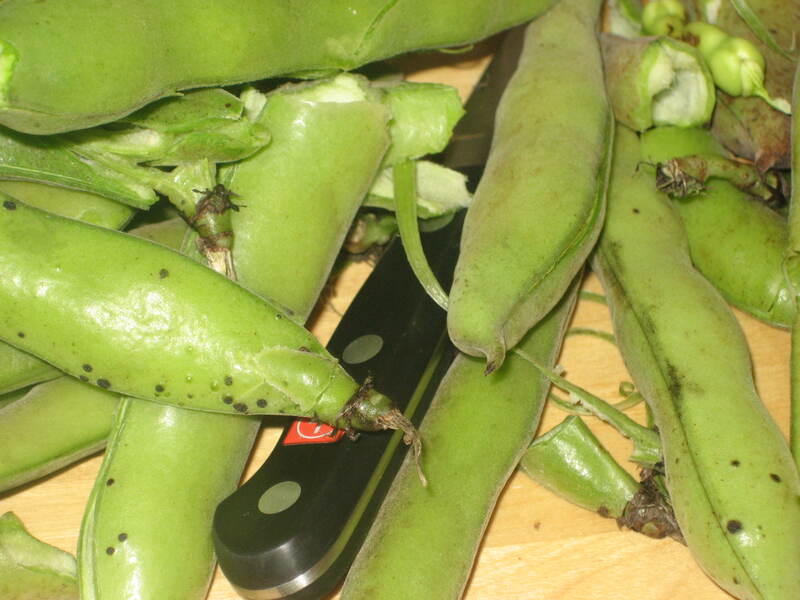 Well, they came in long, thick pea pods–think snap peas on steroids. I went home with a little more than a pound, with no idea how I was going to prepare them. 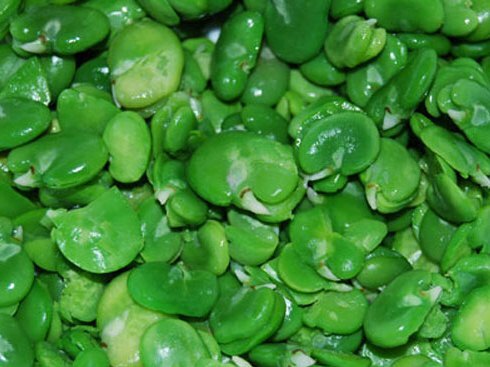 Luckily, a quick Google search turned up pages and pages of how to shell fava beans. Step 1: Remove the beans from the pod by running your finger along the seams. I found it easiest to snap (or cut)noff the top end (where the pod would attach to its stalk) and with that would come one of the side veins, opening up the pod. Step 2: The inside felt almost like a fleecy blanket. Trust me, these beans were well protected! Next you need to remove the second layer of skin on the beans. Blanch the beans in boiling water for 30 seconds. After submerge the beans in ice water to stop cooking and quickly cool. Step 3: Squeeze each bean on one end until you feel a slight gap between the bean and skin. 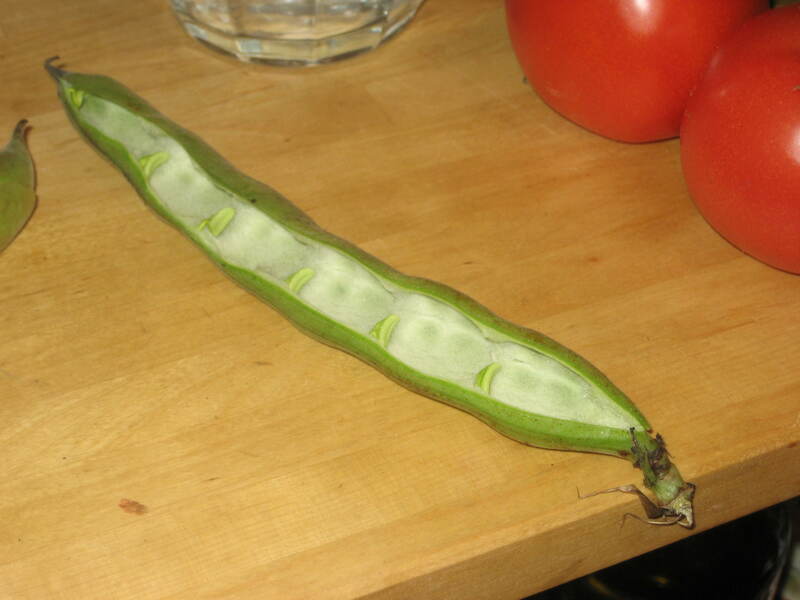 Cut a small slit with a pairing knife and squeeze the other side of the bean to push it out of its skin. Step 4: Prepare as desired. Sure 4 steps seems pretty easy, but after de-skinning each individual bean TWICE, time adds up. At that point, I was ready to eat; no fancy preparation this time! 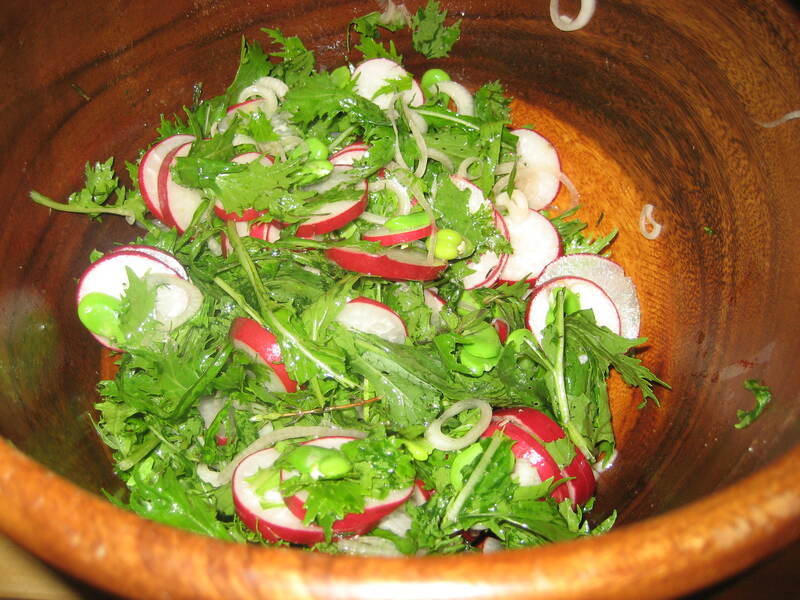 I ended up tossing them into a salad with mizuna greens, radishes and pickled onions. While I certainly appreciated the experience and liked trying something new, next time I think I’ll just stick to eating fava beans when they’re prepared for me. Now, it depends how much time I feel like cooking this week, but I hope to at least include some, if not all of the 8 highlighted ingredients in this year’s Eat Drink Local Week. First to check off the list: Rose Wine. Now, you might not know me that well, but I can promise wine is never something I can’t include in my diet. My husband and I have our own Brooklyn “wine cellar”, which is really a section of our walk in pantry closet and an excel document to organize it all. Yeah, I know, we’re kind of nerds. We try to visit NY state wineries a few times a year, especially the North Fork, since it’s so close. It go to the point that we’d bring home so much wine, that we weren’t able to keep track of what was good and what was really good. We’d have take out on a weekday night, pop open a bottle and comment how good it was, before realizing it was a more expensive bottle that we really should have saved for a few years. Thus, our wine archive was born. It’s also helpful in reminding us what wines we REALLY liked and ones that were so so for future trips. Now I’ve only been going to the Grand Army Plaza Greenmarket for a few weeks now (formerly an avid Fort Greene Greenmarket shopper), and was excited to learn Castello di Borghese visits every other Saturday. Perfect for finding a new local rose! 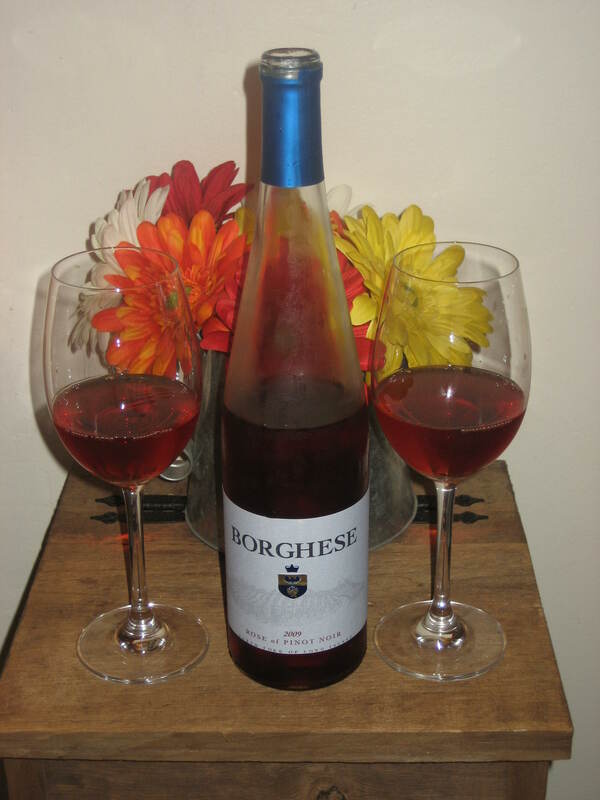 Borghese is the North Fork’s oldest winery. I’m a big fan of their Cabernet Franc and Merlot wines, but have never really tried their roses. The one that caught my eye was a 2009 Pinot Noir Rose. Just as promised, it was rich and spicy and held up well for my steak dinner that night. The saleswoman mentioned since it was pure Pinot Noir grapes, it could easily be as delicious served room temperature in the winter or chilled and crisp in the summer. I will certainly become a regular of Borghese’s stand! One local ingredient down, 7 more to go! For those of you not aware, tomorrow starts Eat Drink Local Week, sponsored by the Edible Magazines. Now, I understand, we all can’t be perfect little locavores, like me, but Eat Drink Local week is the perfect time to try. The week long event raises awareness for and celebrates local food grown in our region, restaurants that serve it and partners that support it. You don’t really even have to cook if you don’t want to! There are over 100 restaurants throughout Manhattan, Brooklyn and the East End celebrating Eat Drink Local week with prix fixed meals, featuring local ingredients. 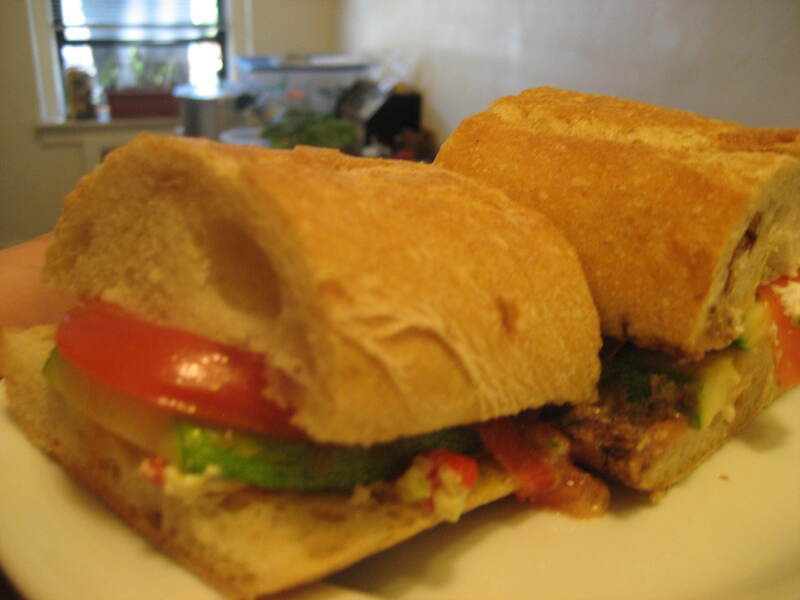 You cam try a new place each and every week! Some of my favorites include al di la and iCi in Brooklyn, Telepan and Craft in Manhattan and The North Fork Table & Inn (which I have yet to get to but have heard amazing things!). Most or all ingredients should be available at your local Greenmarket. Between my husband and I can guarantee we’re covered with Rose and Hops, but I hope to incorporate some of the other listed ingredients into my cooking too. Maybe even find a new staple recipe! And of course, there’s always time to dine out at least one night. Happy Eat Drink Local Week!